Once in a while a book comes along which stands out from others. 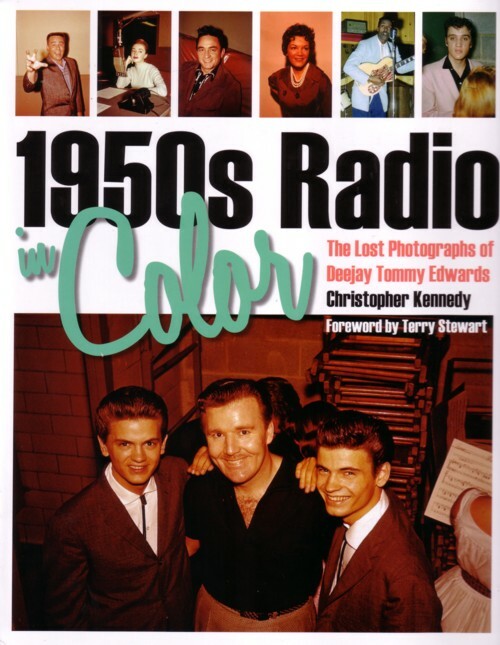 Quite simply, 50s Radio in Color is one of those rare releases! Why? Because it contains one of the greatest treasure trove compilations of rock ‘n’ roll performers you will ever see and the glorious images are presented in full COLOR. Popular Cleveland deejay Tommy Edwards was privileged to meet and capture on Kodachrome many of rock ‘n’ roll’s greatest names plus numerous other film and TV identities. As one slowly savors (believe me you will savor each page) the time capsule and evocative imagery that 50s Radio in Color provides, you are transported back to a by-gone era, a time of innocence, bobby-soxers, fun and a world largely oblivious to the incredible and unstoppable socio-cultural change that was occurring with the explosion of rock 'n' roll and the youth movement. From the well known such as Elvis, Pat Boone, Liberace, Doris Day, Henry Fonda and Bill Haley to the lesser known including The Short Twins, Pat Hampton, Grandpa Jones (with his impressive, but disappointingly fake, moustache), The Shortcuts, Gordon Young and Elaine Dunn, the images and accompanying narrative are sublime. And I just love the platinum-dipped Maid Marian, known as Robbin Hood, who was once signed to Coral Records but apparently failed to score a bullseye with her singing. 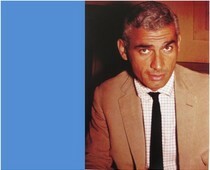 Other prominent stars featured include Liberace, Dolores Hart, Slim Whitman, singer-songwriter Paul Evans (who wrote several songs for Elvis including I Gotta Know), Wanda Jackson, The Diamonds, Andy Williams, Al Martino, Johnny Cash, actor Earl Holliman, Michael Landon (of Bonanza et al fame), Jayne Mansfield (mother of Law & Order’s Mariska Hargitay), Dale (Suzi Q) Hawkins, The Everly Brothers, actor Jeff Chandler, Sanford (The Fool) Clark, Marty Robbins and Harold Jenkins. Harold Jenkins you ask? Perhaps you know him better by his stage name.…...Conway Twitty. There are great shots of Chuck Berry, Roy Orbison, Eddie Cochran and Gene Vincent, and many stunning ladies adorn the glossy paper stock: Goldie Hill, Toni Carroll, Kathy Barr, actress Rhonda Fleming, Leigh Snowden, a pneumatic Gloria Mann, an equally pneumatic Helene De Lys (as the boy wonder, Robin would have said, "Holy torpedos, Batman!) and former child prodigy, Anna Maria Alberghetti, to name only a few. You have to see the photos to appreciate their greatness! They literally jump off the page and envelop your senses. Fresh, alive, wonderful……obviously Tommy Edwards was not only a great deejay, but also a formidable cameraman with a keen eye for staging and lighting. Each of the absolutely stunning color candids is dated and author Christopher Kennedy provides illuminating text for each of the hundreds of images on display. Kennedy’s text evokes the context of when each still was captured, oozing resonance of that wonderful awakening period that was the 1950s. A cappella singing is like being up on the highwire with a tank of hungry sharks circling below. By the time the twenty-year old singer returns to the Circle in October, all the pieces are in place, all the fuses lit. The truth is, only a select few knew the real story behind Presley’s adventures in Cleveland. There were always little girls hanging out backstage, sisters or girlfriends of our musicians. We had a couple of little hot tomatoes who were about fourteen years of age, and after Presley got through with his first show, these girls…..
A great page design allows both the image and the author’s carefully considered narrative to shine. For the record there are several impressive images of Elvis all captured on October 19 and 20, 1955. 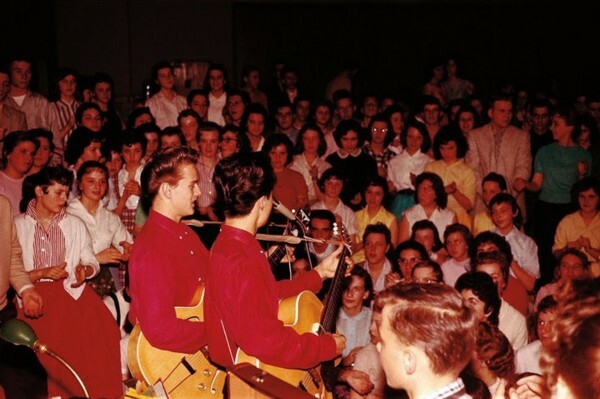 They include Elvis live on stage (several in color and a b&w shot from the filming of the proposed film, The Pied Piper of Cleveland), the handshake meeting of Elvis and Bill Haley and an unusually expressive Elvis signing autographs for fans backstage at St. Michael’s Hall in Bradview Heights, Cleveland (see partial image on book cover). Elvis’ unusual expression was probably due to Tommy Edwards catching him unaware when snapping the photo. 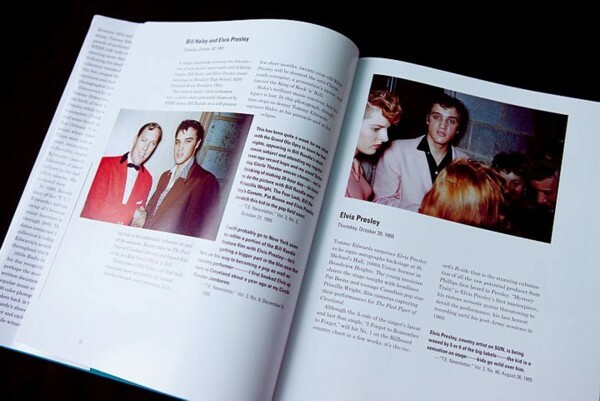 References to Elvis and his impact appear throughout the rest of the book. As noted in the Publisher’s pr, Tommy Edwards archives of photographs of the stars was thought lost. That was until Christopher Kennedy, when searching for the holy grail of rock‘n’roll films, The Pied Piper Of Cleveland, came across another spectacular find – Edwards' never before published colour photo collection. And what a find it was! Verdict: 50s Radio in Color is an expertly polished diamond of a release! 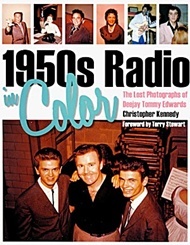 With its sublime full color images and exceptional text by Christopher Kennedy this book will be eagerly and deservedly devoured by lovers of both rock ‘n’ roll and the 1950s. As a window to a piece of musical and socio-cultural history it is par excellence. Bring on Volume 2!